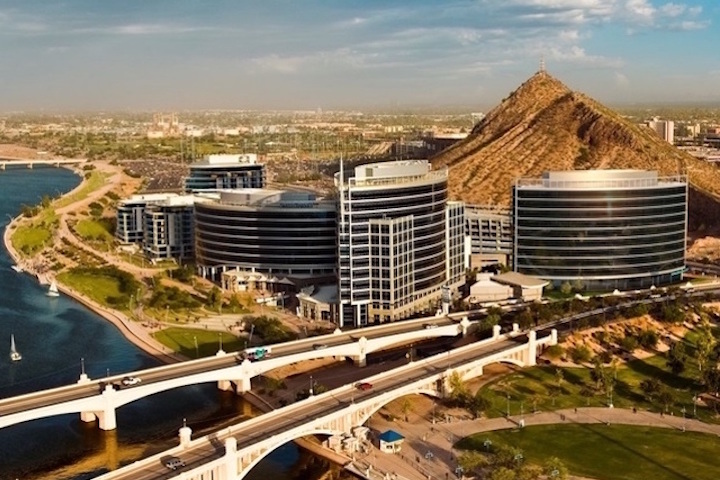 Tempe Real Estate is in a prime location; just East of Phoenix and South of Scottsdale. We are excited to provide a detailed list of all the homes, townhouses and condos for sale in the various Tempe neighborhoods. Here you will find the most comprehensive website for Tempe Real Estate found anywhere online. Tempe is of course home to ASU (Arizona State University) where students from all over the country come to attend school in the warm sunshine. Sun Devil Stadium hosts many annual sports events including the "Fiesta Bowl" and Tempe is also home of the "Diablo Stadium" where Spring Training occurs every March. Mill Avenue is a tourist draw offering a host of restaurants and nightlife. Below are the latest listings currently for sale in Tempe, Arizona. Our Russ Lyon Sotheby's Tempe Experts can help guide you through the variety of neighborhoods, styles and price ranges and help you find the perfect home in Tempe. To set up a private tour of any home you see here or for information on how to sell your Tempe home contact us at; 888-316-4622. 4 Twenty One West 6th St.